Halloween is by far my favorite holiday, and not because my 4-year-old son brings home a ton of candy on the night of Oct. 31. I love the old Universal Monster movies from the 1930s, 40s and 50s. Watching them now, they're not scary at all, but there's so much nostalgia associated with them. Plus, the film makers did a great job bringing humanity to the likes of Frankenstein's monster, the wolf man and the mummy. 1. 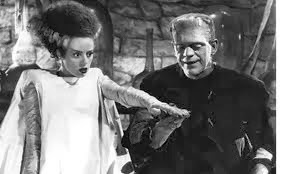 "Bride of Frankenstein" (1935): Boris Karloff as the Frankenstein monster is superb, and Elsa Lanchester's gray-streak hairdo remains iconic to this day. Easily the best Universal Monster film ever, and a must-watch. 2. "The Wolf Man" (1941): Lon Chaney Jr.'s makeup as the Wolfman is awesome, as is his performance as the tortured Larry Talbot. 3. "Creature from the Black Lagoon" (1954): One of the last films from the golden era of Universal Monster movies was years ahead of its time. Before "Jaws" made you fear what lurks beneath the water, the gil-man did the same. 5. "Abbott and Costello Meet Frankenstein" (1948): Loved this film when I was a youngster. What more could a kid ask for then two comedians, the Frankenstein Monster, Dracula and the Wolf Man? Now that Macy's is joining the other stores opening on Thanksgiving, I wonder if some families are going to start doing things in reverse. Instead of enjoying the holiday, then going shopping, they would do it backwards.They would use Thursday to travel and rest up for the big night (don't forget to hydrate. You don't want to cramp up while racing down the aisle to electronics). After shopping from Thursday night into early Friday, everyone would come home exhausted, sleep in Friday, and then have a big meal, giving thanks for the bounty they secured the previous evening. Does that go against the original intent of Thanksgiving? Pretty much. But the stores wouldn't be opening if there wasn't demand, would they?